When did this happen? 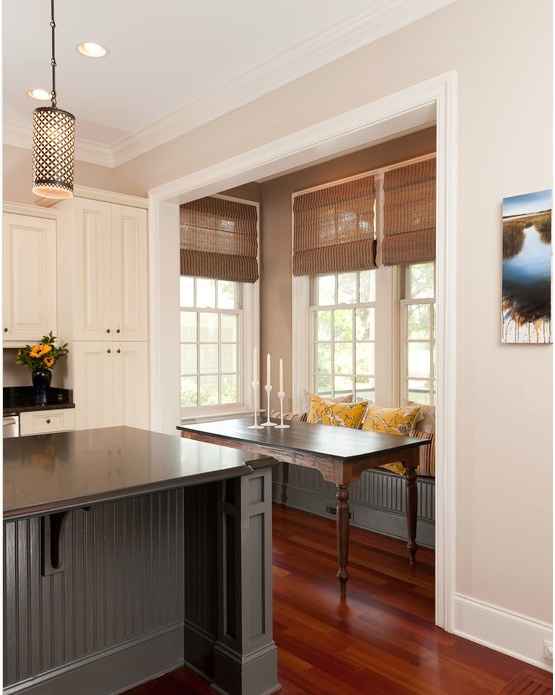 Benjamin Moore’s Kendall Charcoal HC-166 has bumped long-time favorite Revere Pewter HC-172 out of first place as most searched paint color on the Hirshfield’s blog. I was surprised. Revere Pewter has held the first place spot for the past couple years as everyone’s beige/gray favorite. 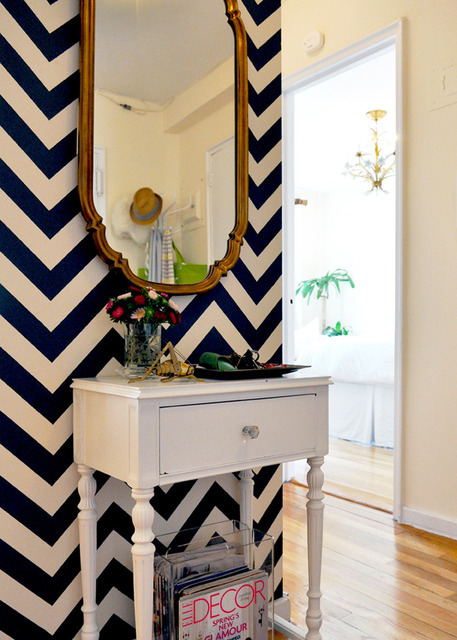 Sarah created an entryway in her apartment with this great oversized chevron pattern, painter’s tape, and Kendall Charcoal paint. 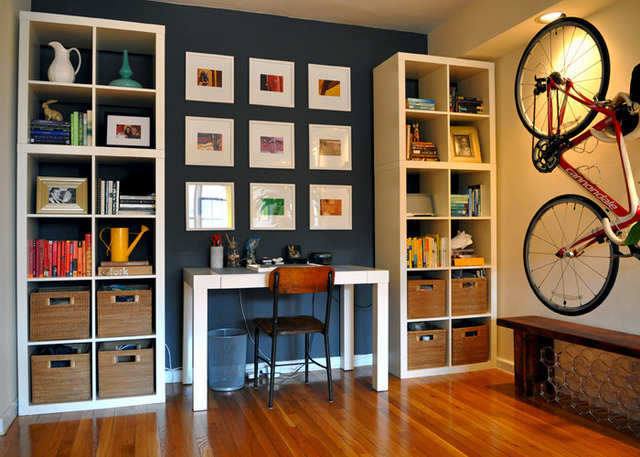 With the high contrast of paint colors, charcoal and white, this small space makes a huge welcoming impact. How to determine which colors are popular with Hirshfield’s customers? Talking with H’s employees who refill the paint swatches in the chip racks and mix up the paint. How’s that for a high tech, top secret, evaluation process? Cindy (H’s Maple Grove) tells me she is constantly filling in Kendall Charcoal (and other darker grays) on the Benjamin Moore chip rack. She thinks customers like the idea of using darker grays, but when it comes right down to it, they back off, and order a lighter and safer paint color. They mix a lot of Revere Pewter and Hirshfield’s Oak Tone 0217 at the Maple Grove store. She’s also seeing an increased interest in accent walls – here’s where the customer will choose a darker paint color, or use wallpaper, on that one focal wall. Want more? 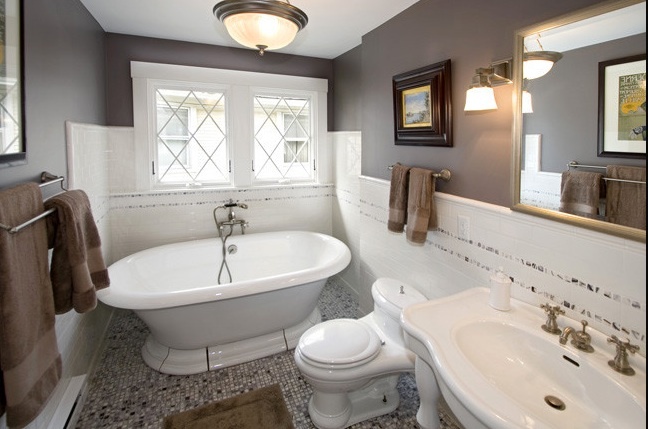 Color Chats from Benjamin Moore showcased their 50 favorite grays in this June blog post.